PHOTO COURTESY OF SUZANNE FRAZER / B.E.A.C.H. Charles Moore, head of the Algalita Research Foundation in Long Beach, Calif., right, joined volunteers with the Beach Environmental Awareness Campaign Hawaii and University of Hawaii Hilo students last month in a cleanup of Kamilo Beach on the Big Island. A visiting California researcher says Hawaii is "being invaded" by marine debris, some of it detaching from a large concentration of junk in an area known as the Great Pacific Garbage Patch. Charles Moore, a captain with the Algalita Marina Research Foundation in Long Beach, Calif., said he first saw the so-called patch in 1997 while sailing back to California after a boat race to the islands. It accumulates debris from Pacific Rim countries, he said. "It's a new kind of an invasion," Moore said, "an invasion of civilized nations against the coast of Hawaii. But it's one in which there's no individual culprit." The University of Hawaii at Hilo has been hosting lectures by Moore and 13 other speakers about the threat to Hawaii of an estimated 50 tons of marine debris that washes ashore annually. After completing a boat race from California to Hawaii, Charles Moore sailed home to Los Angeles through a windless portion of the Pacific Ocean that boats and fishermen often avoid. It was about halfway through his shortcut a decade ago that Moore stumbled upon what he now calls the Great Pacific Garbage Patch: an area he estimates covers twice the state of Texas, clogged with tiny plastic pieces and floating junk. Realizing it was a mess too big and too remote to clean up, Moore embarked on a mission to research and raise awareness about the so-called patch as well as the global issue of marine debris. Isle residents, he said, should be particularly concerned about an expanding patch that comes as close as 800 miles north of the state, saying that some of the trash follows currents to Hawaii. "You are being invaded by plastic debris and your beaches are turning into plastic," Moore said, adding that a similar phenomena happens somewhere between Hawaii and Japan. The 60-year-old captain of the Algalita Marina Research Foundation in Long Beach, Calif., is on the Big Island with a dozen volunteers giving public lectures and researching marine debris through January. The threat of toothbrushes, bottle caps, cigarette lighters and other stuff drifting toward Hawaii, he said, worsens in the winter and especially during atmospheric changes caused by El Nino, when the patch shifts south and releases "billions and trillions of plastic bits." "And you can't rake all your beaches because you got a lot of rocky beaches," Moore said. "It's going to be super labor-intensive trying to get this stuff out." Moore argues the patch is just as harmful as fishing gear that kills turtles and endangered monk seals because it creates a plastic layer just below the ocean surface that blocks sunlight and impedes the growth of seafloor vegetation. Fish are feeding on the plastic, he said. The issue is now grabbing the attention of government researchers with the National Oceanic and Atmospheric Administration. The agency is interested in studying how plastic fragments that make up the patch affect seabirds and other marine life, said Carey Morishige, NOAA's Pacific island outreach coordinator. "What we are trying to move from is beyond just the marine debris removal," Morishige said. "We can remove it for generations and generations, but it is really to try to stop it before it comes to shore, or better yet, stop it at the source." Moore said his crew has seen trash in Hawaii with labels from Japan, Taiwan, China and even Russia. But California also is believed to be a major contributor. A recent study found that two rivers in Los Angeles discharged about 2.3 billion plastic pieces into the North Pacific in just three days, Moore said. There is no better place in Hawaii to witness the harm of marine debris to the ecosystem than at Kamilo Beach on the Big island's south coast, said Suzanne Frazer, founder of the Beach Environmental Awareness Campaign Hawaii. The same currents that once brought logs used by native Hawaiians to build canoes is littering Kamilo with junk, Moore said. "Instead of getting sand in my shoes ... 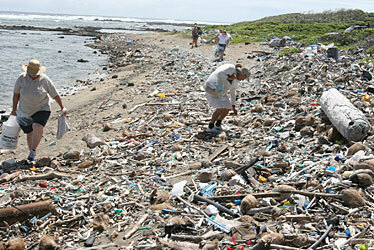 I had plastic," Frazer said about a beach cleanup at Kamilo last month. "It is really horrendous." Because Hawaii sits in the middle of the Pacific, it is in an ideal position to study ocean dumping and reach out to Asian countries, the continental United States and Central and South America, Moore said. This year, he donated $30,000 through the Will J. Reid Foundation to the University of Hawaii at Hilo, which has used the money to bring marine debris experts from around the world. UH-Hilo marine science professor Karla McDermid said students enrolled in her pilot marine debris class this semester have gone out on field trips and learned from scientists speaking about chemicals in plastics and how ocean currents carry debris to Hawaii. A chemical engineer is scheduled to talk about cleaner alternatives like biodegradable plastic, she said. "We are getting the public awareness up," McDermid said. "It's a multidisciplinary problem."